Contemporary Oriental Medicine (COM) is a modern paradigm which incorporates the strengths of diverse traditional practice into a single workable model, characterized by an emphasis on diagnosis and lifestyle. COM exceeds state educational standards, enabling practitioners to collaborate effectively with Western Medicine professionals. More importantly, COM allows for delivery of highly effective and compassionate health care in the best tradition of Oriental Medicine. The vast array of Oriental Medicine treatment modalities available today can be confusing to those students who must choose a path of study. To address this complexity, COM strives to integrate the best features of Traditional Chinese Medicine (TCM), the Five-Element Model, and other diverse traditions, providing practitioners with a solid foundation for their practice. Effective communication and collaboration with practitioners of Western Medicine is the goal of those committed to COM. The two medicines are complementary, in that each brings important benefits to the patient. Ultimately, proponents of COM envision its place as an equal partner with Western Medicine, enhancing and broadening the delivery of health care with a new paradigm for diagnosis and treatment. The practice of Oriental Medicine is over 5000 years old. Considering the changes in disease patterns and stresses in the world today, COM strives to modernize diagnosis and treatment to achieve optimum usefulness to both practitioner and patient. While maintaining the essential richness of the ancient writings, COM encourages examination of both traditional and contemporary literature, with the intention of verifying or updating theses which may have been accepted for centuries. The keystone of COM is a strong emphasis on diagnosis, and especially pulse diagnosis (neglected in the TCM version of the medicine). There can be no truly lasting, effective treatment without a good sound diagnosis. Contemporary Chinese Pulse Diagnosis® (CCPD) is a modern version of the ancient art. It is an exquisitely sensitive scheme, capable of assessing the process of disease close to its inception. Therefore, CCPD is able to provide a truly preventive medicine. Contemporary Oriental Medicine emphasizes the lifestyle of each patient as a primary cause of disease, and therefore a key component of treatment. Good diagnosis assures treatment of the root; when the root heals, so do the branches. 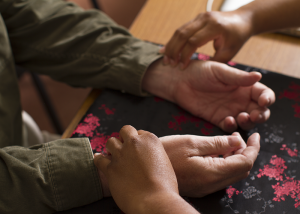 Contemporary Chinese Pulse Diagnosis® is a method of assessing the patient’s unique physical, mental and emotional resources and vulnerabilities, as weighed against the various drains on these resources. Students learn to gain this critical information from the pulse, even when, as often happens, it is not reported correctly by the patient. This ancient-but-updated diagnostic modality guides every acupuncture and herbal treatment. The pulse provides us with a Preventive Medicine. This takes the form of information about the disease process that has not yet revealed itself clinically, and about what drives that process in an individual life. With mastery of the pulse, the Acupuncture physician can map out the strengths, weaknesses and therapeutic needs of each patient as unique and different from all others. The pulse makes it possible to treat the individual person. The acupuncture program at DRCOM encompasses the teachings of Contemporary Oriental Medicine® that draw upon many aspects of the system, including Traditional Chinese Medicine and Five Element theories. Acupuncture channels and point locations are taught along with channel pathology and acupoint actions, indications and needling techniques. A good working knowledge of acupuncture points and channel theory, combined with an extensive training in comprehensive assessment and diagnostic skills, gives our graduates the ability to perform state-of-the-art, therapeutic acupuncture treatments. Although in the West, acupuncture is the most recognized aspect of Chinese medicine, in China herbal medicine is at least as significant. The same theoretical and diagnostic rationale can be applied to acupuncture and herbal medicine, though in practice there are differences. Acupuncture is particularly effective in pain management, stroke recovery and especially psychological disharmonies, while herbal medicine is particularly effective in the treatment of a weakened body condition, as seen in the chronically ill, constitutionally compromised or elderly. Herbs can also be very effective for shortening the course of acute infectious disease of viral and bacterial origin, and minimizing their long-term repercussions. This may become an increasingly important use of herbs in view of the widespread resistance of bacterial pathogens to antibiotics. Herbal medicine can rectify the conditions within a patient’s body that provide the opportunity for the proliferation of disease-causing entities. Many classical herbal formulas have displayed therapeutic effects for modern diseases, and herbal medicine remains an innovative discipline that has adapted to modern conditions. Herbal formulas continue to be created that provide remarkable therapeutic benefit to patients with autoimmune disorders, hypertension, high cholesterol, exposure to toxic chemical substances, diabetes, and hepatitis, among many other chronic conditions. A significant advantage of this medicine for the patient is that herbs can be taken on a daily basis, while daily acupuncture treatments are generally not feasible. Traditionally, acupuncture physicians master both acupuncture and herbalism in order to treat effectively the greatest number of patients. Chinese herbal medicine is one of the oldest surviving traditions of herbalism, widely and vigorously practiced for millennia. The Chinese herbal tradition represents perhaps the richest resource available to us about the therapeutic use of herbal medicines. In Chinese herbal medicine, substances are combined in a “formula” which creates a synergistic effect. This allows doses of individual herbs to remain low, and side effects are minimized. Furthermore, within each single herb, multiple chemical compounds are present and create a similar synergism. Currently there is a movement in Western pharmacology that emphasizes the combination of drugs in order to create a synergistic effect, yet replicating the intelligence innate in naturally-occurring herbs will not be easy. The side effects of biomedical drugs can be devastating and even life-threatening; it is therefore important to employ natural substances as medicines, especially as our modern lifestyle increasingly alienates us from natural environments. Classical formulas are elegant and well-balanced, yet rarely do they exactly fit a patient. The curriculum at Dragon Rises College of Oriental Medicine includes the study of classical and modern formulas, and the principles of how to compile a formula for an individual patient. The process of precisely tailoring a treatment to an individual is one of the great strengths of Chinese medicine, and is largely missing from Western biomedicine. The administration of herbs is largely unregulated, yet the responsible use of herbs requires an accurate diagnosis. 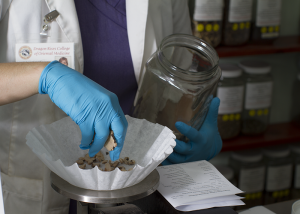 The emphasis on diagnosis at Dragon Rises College of Oriental Medicine, and the preparation for the Chinese herbal medicine exam, creates practitioners who are able to apply the ancient wisdom of Chinese herbal medicine in our modern times. Our clinical training program at DRCOM provides excellence in diagnostic techniques with emphasis on Contemporary Chinese Pulse Diagnosis® by supervisors with Master level training in this skill. Classic acupuncture, moxibustion, and individualized herbal formula treatments are enhanced by modern techniques, such as ear and scalp acupuncture. Students start clinic observation in the first semester, and their involvement in treatment is a steady progression as they increase their skill and understanding. Close supervision in the initial phases is succeeded by the student assuming more responsibility for the treatment, with the supervisor remaining available for guidance and assistance as needed. Our goal is to train students as primary-care providers. Our students graduate with skills to treat disease as acute as the common cold or as chronic as the sequelae of stroke. We offer students a well-organized clinic with a nurturing atmosphere, where they can develop at their own pace into highly-qualified professionals. Oriental Energy Exercises focus on personal healing and growth. In other classes, the mind is used to learn about Chinese medicine. In studying Oriental Energy exercises, the learning happens from within the body and energy system. 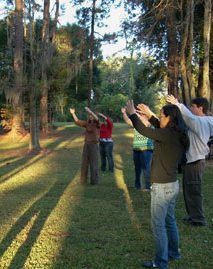 The exercises are different forms of Qi Gong, including instruction in Tai Ji Chuan. 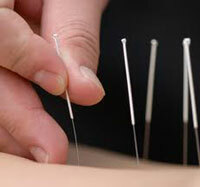 Students will learn how the acupuncture channels and Qi energy actually exist and move in the body-mind. The goal is to recognize the existence of Qi and Center energy, and to build and refine them. When Qi and Center are strengthened, the practitioner will be more resistant to disease and able to become a higher-level healer. Through the practice of Oriental Energy exercises the medicine comes alive. All of the great doctors in the long history of Chinese medicine have practiced some form of Qi development exercises. The classes are all experiential, with great emphasis placed on learning from within. Classes are tailored to the individual, and students progress at their own pace.